Pictured above Frank Loveridge on the pretty Aprilia RS4 125. Frank didn't have much time to set the bike up as he only received it a few days earlier. It hadn't had any run on a track so it was try it out and see how it went. When similar mods that are allowed on the CBR125s are done to it (exhaust, fuel injection mapping etc.) it should fly. Finally another make to maybe challenge the winning ways of the ubiquitous Honda CBR125s. Another RS4 125 is being campaigned by ACT rider Jessica Dykes in the Commuterlite AM class. 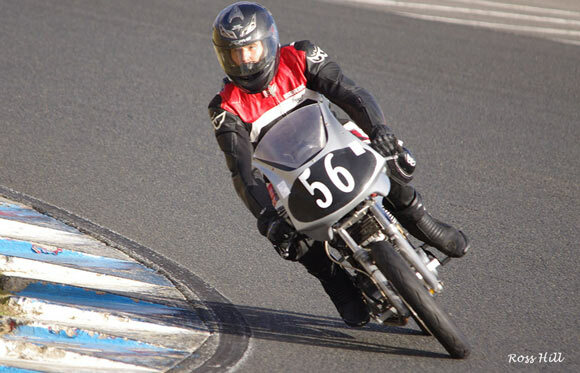 Robert Young has been running a KTM 125 Duke with varying success. Barry Sheene Festival of Speed 2015. BRA President and PCRA Vice-President Ken Lindsay has made a request for BRA members to put their hands up to help at this years BSFOS. Help is required in two areas. 1. Friday morning 20th. March 6.30AM to approx. 10.00AM at Eastern Creek Scrutineering Bay. Three or four helpers to erect two gazebos alongside the scrutineering bay and to give directions and help out in general. When Scrutineering finished, dismantle gazebos and move to and erect at designated position of BRA promotion stand in trade area. A few volunteers to man the BRA promotion stand both days. Can arrange suitable times as long as one or two people present during the two days. Entry tickets will be provided in all cases. 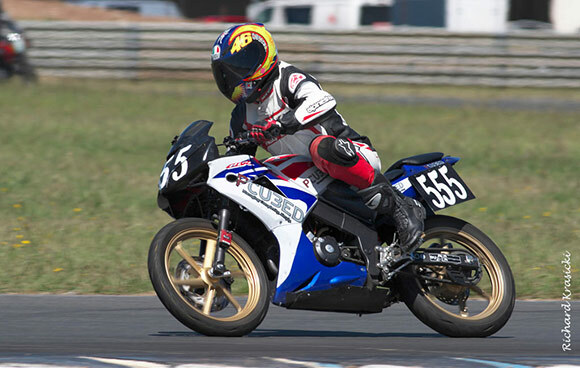 Read Oliver Higgins account of building a Honda CBR125 Commuterlite Racer eligible for the Bucket Racing Association's (BRA) race series, run in conjunction with the Post Classic Racing Association (PCRA). Round one of the PCRA BRA Bucket championship got off to a great start for the 2015 season. The weather was brilliant, track in good condition, close exciting racing and no major incidents with the full racing program being got through. Is this a good omen for 2015. Congratulations to the organisers and scrutineers who have come up with a whole raft of new procedures to streamline the days activities. The scrutineers in particular were very thorough to ensure the bikes were as per the MOMS. Forty plus Bucket Racers get under way in race one at round one at Wakefield Park. #6 Jason Dunn already with a good lead went on to win all three Motolite races. 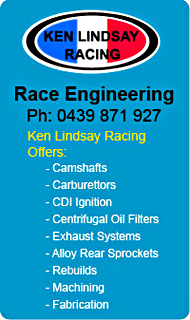 Practice and qualifying combined is being trialled this year and worked well at this meeting. The riders do two laps untimed (practice) and then are timed for the rest of the stint with the fastest times converted to their grid position for race one as with normal qualifying. Thereafter riders start on the grid in the finishing order of the previous race. 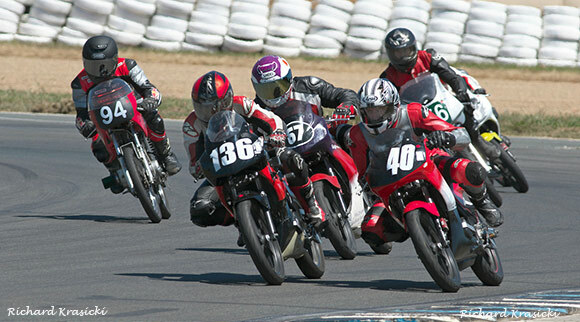 A strong Motolite field fronted the starter at Wakefield Park for round one of the PCRA BRA club championship. Jason Dunn Shane Wilcox the Marsden Brothers all committing to a full season of Motolite racing. New faces on the grid were 77 Christopher Jones (BBE engines Honda RS150CBR) and #63 Matt Burton (BBE engines Honda RS150CBR) Should be an exciting years racing. #6 Jason Dunn was in scintillating form winning all three races. Here he leads #86 Anthony Marsden and #74 Ron Carrick. Number 6 Jason Dunn (Honda RS85cr) the 2011 and 2013 Motolite champion is back for a full season and it seemed like he took up where he left off in 2013 winning all three races to score maximum points. In race one #86 Anthony Marsden (Chris Sculley Honda RS85cr) was closest to Jason with #74 Ron Carrick (Yamaha TZ85) of Queensland hot on his heels for 3rd, Number 68 Shane Wilcox (Sculley Honda RS85cr) came in 4th with newcomer #77 Christopher Jones on the ex Tyler Bradford (BBE Honda 150) last year's championship winning bike just a whisker behind coming in a fine 5th on his first race on the bike and at Wakefield Park. As in race one Jason stormed into an early lead never to be headed. The trio of Anthony Marsden Shane Wilcox and Ron Carrick were swapping places until Anthony went down in turn two on lap 3. Shane clung on to 2nd from a very racy Ron Carrick. The finishing order behind them was 4th. #83 Edward Marsden, 5th. #32 Marty McGauley, 6th. #63 Matt Burton (BBE Honda RS150). They were followed home by #11 Michael McLean (Honda CBR150), #170 Michael Child (Supermono 197) and #212 Jeff Angel (Moriwaki 85). This year the Superlite Pro field is looking healthier as a number of riders have been graded upward from Superlite AM and John Olip is running his P4 Suzuki 100 2 stroke in this class. With the King (Ken Lindsay) not riding due to injury he offered the ride to Harley Borkowski who gladly accepted. Harley (#2 Honda RCB150) won Race one but had to give best to a racy Ian Gregory (#169 Honda CB150) in races two and three. Ian Gregory (#169 Honda CB150) had missed qualifying due to some technical problem and had to start from the back of the grid. At the start #2 Harley Borkowski (KLR Honda RCB150) jumped into the lead with the slow starting #38 Junior Murphy (BBE Honda CB150) in hot pursuit. Ian Gregory by the end of lap one amazingly was up to 3rd. So at the finish the order was 1st. Harley, 2nd. Junior, and 3rd. Ian. They were followed home by #81 Robert Tisdell (Honda CB150) , #62 Jim Murphy (BBE Honda CB150), #8 Kurt Wagus (BBE Honda CB150), #65 Tim Smith (Honda CB150) and #94 John Olip(Suzuki 100). Starting from 3rd spot on the Superlite Pro grid #169 Ian Gregory was in a better position to challenge for the lead and first time around he did just that. However Harley wasn't giving in that easily and he harried Ian right to the end but Ian got the win by a mere four hundreds of a second. Junior had held a watching brief on all this but had to settle for 3rd. #8 Kurt Wagus (BBE Honda CB150) after a lacklustre race one (for him) got the bit between his teeth and dispatched #62 Jim Murphy down to fifth and #81 Robert Tisdell to sixth. #94 John Olip on the only 2 stroke came home 7th. It was a determined Harley Borkowski that lined up for the start of race three and making a perfect start he rocketed into the lead and it looked like he could do it but #169 Ian Gregory was having none of it as he shadowed the blue #2. Meanwhile #38 Junior Murphy had lost time due to an off track excursion and was racing back through the field. Coming into the last corner Ian timed his move to perfection slipping past Harley and winning the dash to the line by seven hundredths of a second. Junior managed to get back to 3rd. with Kurt Wagus 4th, Jim Murphy 5th. Robert Tisdell 6th and John Olip 7th. That was close exciting racing. Five times Runner up in the Superlite Pro class since 2009 (8th in 2012, didn't do a full season) #169 Ian Gregory leaves the first round of 2015 with a well deserved Championship points lead. Ian rode like a champion to be on Saturday. First of all getting to 3rd at the finish after having to start from the back of the grid in race one and then narrowly beating Harley Borkowski not once but twice in races two and three who was riding the Kings Honda RCB150. Can he shake off the Randy Mamola tag? Will this be his year? The Superlite AM class is wide open this year as several of former AM class riders from last year have been moved up to the PRO Class. 56 Herman Wagus (Honda CB150) scored a second and two wins to win the day from #181 Glen Tisdell (Suzuki 150) #31 Duncan Taylor (Suzuki 100) came in third. Glenn Tisdell (#181 Suzuki150) jumped into an early lead and held it to the flag posting a promising first race win in the Superlite AM series. #56 Hermann Wagus (Honda150) had qualified poorly due to carburetion problems and had to start from the back of the grid. Showing an impressive turn of speed he had by lap 2 made his way to 2nd which he held to the end. #31 Duncan Taylor (Kawasaki KH100) held onto 3rd. place on the lone Kawasaki 2 stroke. (Rumour has it that Duncan will be riding a 4stroke at the next round) Fourth place went to #164 Darrell Francis(Honda CB150). #181 Glenn Tisdell (Suzuki150) as in race one jumped into an early lead but on lap two #56 Hermann Wagus (Honda150) went past and try as he might Glenn couldn't get it back and had to settle for 2nd. Once again #31 Duncan Taylor (Kawasaki KH100) held 3rd flag to flag. 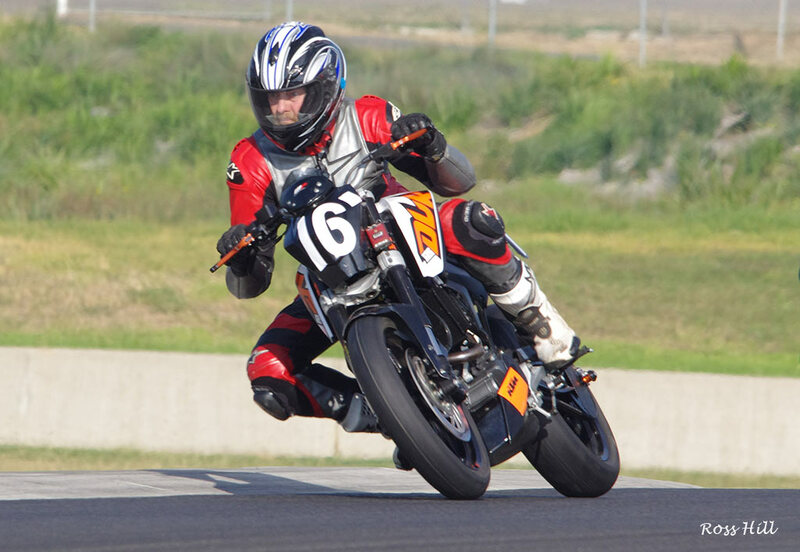 #164 Darrell Francis(Honda CB150) retired on lap two with terminal problems. In race three quick starting #181 Glenn Tisdell (Suzuki150) led until the third lap when once again #56 Hermann Wagus (Honda150) swept past to take the lead from Glenn whose bike started to slow but he still managed to hold onto second from the fast closing #31 Duncan Taylor (Kawasaki KH100). The CommuterLite's looked stronger than ever with several new riders and the introduction of two Aprilia RSV125s. As with the Superlites several of the quicker AM riders have been moved to the Pro class bringing riders of similar experience and speed together. Adam Cameron the 2014 Commuterlite Champion's transition to Commuterlite Pro went smoothly. He continued his winning ways to win the first round of the Pro class from last years Pro champion #136 Ron Pulido. 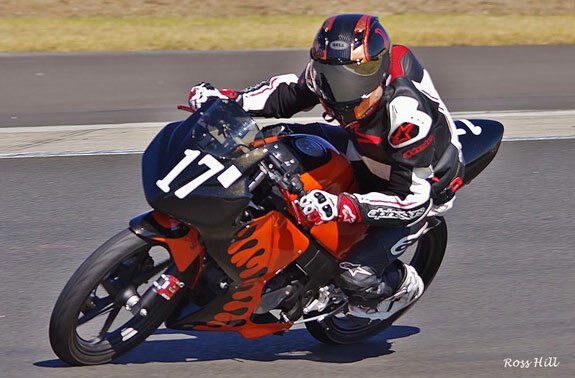 Adam Cameron (#17 Honda CBR125) the 2014 Commuterlite AM champion raced head to head with #136 Ron Pulido (CBR125) the 2014 Pro champion with Adam taking the win. #40 Richard Cook (Honda CBR125) Held 3rd place flag to flag with #67 Richard Draper (CBR125) coming next followed by #13 Andrew Martin (Honda CBR125) and #16 Robert Young on the lone KTM125. This time #136 Ron Pulido (CBR125) grabbed the lead but a great dice ensued with #40 Richard Cook (Honda CBR125)They swapped places several times with Ron prevailing in the end to take a hard earned victory by less than a tenth of a second. #67 Richard Draper (CBR125) running about a second back from Ron, couldn't close them down and finished in a strong 3rd place. #16 Robert Young (KTM125) brought the KTM home in 4th. After such a strong showing in race one #17 Adam Cameron (Honda CBR125) and #13 Andrew Martin (Honda CBR125) would have to be disappointed with 5th. and 6th. However their disappointment wasn't to last long as they bounced back in race three. Ron Pulido got the holeshot and led the Commuterlite Pro field around for the first time but in quick succession #17 Adam Cameron (Honda CBR125) and #	67 Richard Draper (CBR125) got past him shuffling him back into the clutches of his sparring partner in race two #40 Richard Cook (Honda CBR125). On the penultimate lap Richard got the better of Ron who's bike was slowing allowing #67 Richard Draper (CBR125) and #13 Andrew Martin (Honda CBR125) Past. #16 Robert Young (KTM125) finished next. 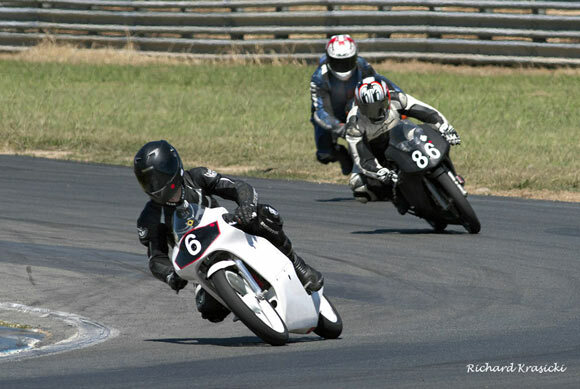 The racing in the Commuterlite AM class didn't disappoint with very close racing throughout the class. with several newcomers in the class it continues to grow in strength. Number 555 Nichoas Miller (Honda CBR125) sensationally was quickest of all the Commuterltes in qualifying. He won the Commuterlite AM class even though he tied on points with #3 Peter Lindsay. Winning the final race of the day was the tie breaker. Peter was second with #131 Rez Pulido getting his first podium, third. The summer break seems to have done #555 Nicholas Miller (Honda CBR125) a power of good as he qualified fastest of both the AM and Pro Commuterlite classes. In race one he ran a flag to flag race winning it convincingly. Big improver #3 Peter Lindsay (Honda CBR125) battled with the hard riding #131 Rez Pulido (Honda CBR125) for second place with Peter getting it by a cats whisker. Newcomer #10 Chris Woodhouse(Honda CB125) raced to an excellent 4th. place followed by #92 Tony Martin (Honda CBR125) to 5th. place. Next up came another newcomer #78 Mark O'Toole on the ex Nicolas Wenban Honda CBR125. ACT rider Lee Raynor came next followed by the two Aprilia's of #88 Jessica Dykes and #108 Frank Loveridge. The Aprilia's are a welcome sight on the grid they look the business and with a bit of development should get to the pointy end. Maybe something at last to challenge the Honda dominance in this class. Quite a few Commuterlite AM riders including Race one winner Nicholas Miller did not get on the track before the pit gate was shut after the 30 seconds board, it meant they had to start from pit lane. Number 3 Peter Lindsay (Honda CBR125) and #131 Rez Pulido (Honda CBR125) raced to first and second in that order with #92 Tony Martin (Honda CBR125) who is showing improved pace this year getting a well deserved 3rd. place. Number78 Mark O'Toole came in an excellent 4th in only his second race ever. Next up was the Aprilia of #108 Frank Loveridge a great result on its first outing. In sixth position came #717 Lee Raynor followed by #10 Chris Woodhouse (7th.) 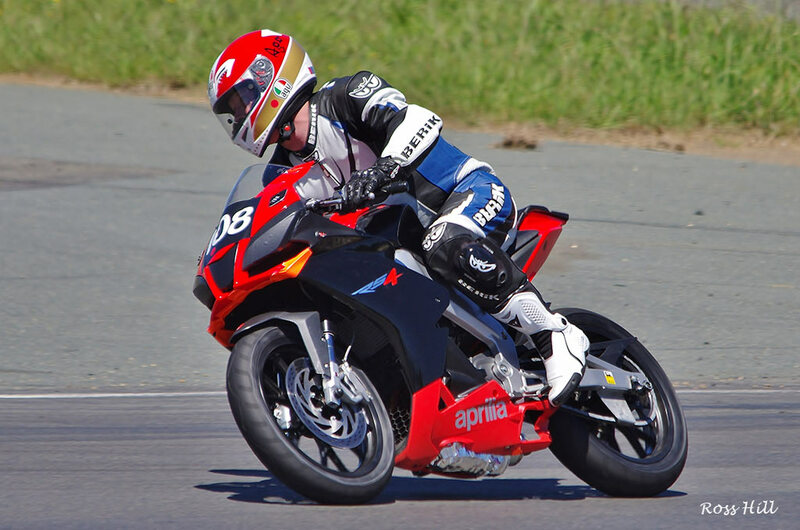 and in eight place race one winner #555 Nicholas Miller followed by #88 Jessica Dykes on her Aprilia 125. Nicholas Miller (#555) made no mistake in race three getting the lead in lap one and increasing it until the flag dopped to win the race and the day. 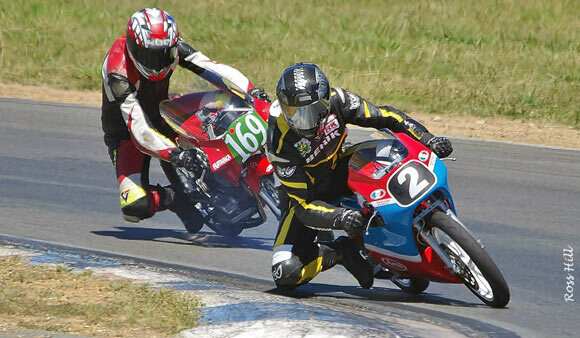 Behind him though a firce battle was going on between #131 Rez Pulido (Honda CBR125) and #3 Peter Lindsay (Honda CBR125) as they raced wheel to wheel for the entire race. It was impossible to tell who was ahead as they flashed across the finishing line, in the end the clock gave it to Rez by 2 thousands of a second. You can't get closer racing than that. Chris Woodhouse repeated his 4th place in race one with #92 Tony Martin 5th and Lee Raynor 6th. Next came #78 Mark O'Toole in 7th. followed by #88 Jessica Dykes and #108 Frank Loveridge. Typical of the dicing in Bucket racing, always close and a lot of fun. Here #136 Ron Pulido Is dicing with #40 Richard Cook and #67 Richard Draper all three are Commuterlite Pro Honda CBR125's. #94 John Olip and #56 Herman Wagus are keeping a close eye on proceedings.